I think Amazon is a bad investment at today's price of $1025 per share, which is 157 times its estimated 2017 earnings, and I recommend that investors either avoid buying it or, if they already own the stock, sell it now. To preempt likely criticism: yes, this is a superficial article, and no, I haven't done a thorough analysis of Amazon's subsidiaries or its expansion efforts. I believe the best arguments against owning Amazon are general and don't require a deep understanding of the company, especially with its stock trading at such a high valuation. Here are five reasons not to buy Amazon stock. Over its life as a public company, Amazon has grown dramatically. From its start as an online bookseller, it's expanded rapidly into other retailing categories and eventually into non-retailing businesses, most notably Amazon Web Services. The single biggest concern I have with Amazon is that it's now expanding into many “hot” areas with intense competition. Content and streaming media, cloud infrastructure, transportation and logistics, and grocery retailing are all priorities for Amazon. They're also priorities for many other deep-pocketed companies. History shows us that companies with high asset growth underperform companies with low asset growth in the stock market. Simply put, higher investment leads to lower returns. The same dynamic holds for industries as a whole, as Marathon Asset Management describes with its capital cycle theory. Jeff Bezos was far ahead of the curve when he realized that cloud computing would change IT and capitalized on that by launching Amazon Web Services. This foresight let him build a large, profitable business before tech rivals like Google and Microsoft could respond with their own offerings. But now, in my opinion, Amazon bulls are extrapolating that success to areas where Amazon won't have a first-mover advantage and the competition will be much fiercer, suppressing returns. Last month, when Amazon announced that it would buy Whole Foods, investors reacted with enthusiasm. They generally felt that Amazon was making a good acquisition because its customer base overlaps with WF's customer base and because WF's grocery stores complement Amazon's non-grocery retailing business. [Bain & Company's] five-year study of 1,850 companies concluded that most sustained profitable growth comes when a company pushes out the boundaries of its core business into an adjacent space. Unfortunately, the research also shows that adjacency moves usually fail. Of the companies Bain studied, 75 percent saw their moves into adjacent markets fail. Only 13 percent achieved what Bain called “even a modest level of sustained and profitable growth.” These companies grew earnings and revenues at least 5.5 percent a year (adjusted for inflation) and earned their cost of capital over ten years. And Amazon is buying Whole Foods in a cash deal, which will require it to issue $14 billion of new debt, so the acquisition involves financial as well as operational risk. As mentioned, Amazon trades at 157x estimated earnings for its current fiscal year. This is much higher than its competitors' earnings multiples: Google trades at 29x current estimates, Microsoft trades at 22x, and Wal-Mart trades at 17.5x. Amazon's earnings are artificially low because the company constantly reinvests its cash flow in growth efforts, which require high current expenses. But even if Amazon pared back its expansion to boost earnings, it would still trade at a rich multiple. And the strategy of constantly deferring earnings makes Amazon's stock risky for a couple of reasons. One, run-rate earnings are one of the basic metrics that investors use to value stocks. If a company's earnings are irrelevant, as Amazon's are, then investors will have difficulty valuing the company. And if valuing it is difficult, then the stock will tend to trade on investor sentiment, which is far more volatile. Two, it makes Amazon vulnerable to rising interest rates. With real rates at historically low levels, the present value of Amazon's expected future earnings is relatively high. Conversely, if real rates increase, its future earnings will be worth less. I'm not arguing that a 1.5% rise in the ten-year rate will destroy Amazon, but I think that ZIRP has artificially boosted its stock price. Amazon gives its employees a lot of stock compensation. I believe the high stock comp creates an unstable positive feedback loop: while the stock is rising, stock comp becomes more attractive to employees and potential employees. This allows Amazon to pay less compensation in cash, which boosts its cash flow, and the higher cash flow enables it to grow more quickly, which boosts its stock further, and so on. If Amazon's stock tanks, this dynamic will likely reverse: stock comp will become less attractive, and Amazon may have to pay more compensation in cash, pressuring cash flow and growth and tanking the stock further. From talking to other investors and reading financial commentaries, I feel that sentiment on Amazon is extremely, unsustainably positive. Some value investors have bought Amazon even though it's a world apart from traditional value stocks. Others can't bring themselves to buy the stock at 150x earnings but admire the company's business model and Bezos' skill as a corporate leader. One manifestation of the extreme sentiment is that people have begun measuring all other retailers by how vulnerable they are to competition from Amazon. Will Amazon start selling auto parts and put Autozone out of business? Will Amazon start distributing industrial parts and disrupt Fastenal and W.W. Grainger? Et cetera. Retail bankruptcies in the United States have surged over the past 18 months, and Amazon has recorded strong growth over the same period, so many people understandably associate the two with each other. But I think a closer look suggests that Amazon isn't on the verge of destroying physical retailers. Best Buy was one of the earliest purported victims of Amazon's expansion. Five or six years ago, people talked about the “showroom effect,” the idea that people would visit Best Buy to look at electronics they were interested in buying and then go online and order them from Amazon at lower prices. But contrary to pessimistic predictions, Best Buy's earnings have slightly increased over the past five years and its stock is near an all-time high. Many of the retailers that have gone out of business, or are on the verge of doing so, are victims of leveraged buyouts gone wrong: Claire, Gymboree, J. Crew, The Limited, Nine West, Payless, Rue21, True Religion, etc. Retailers often have volatile operating income and high implicit leverage in the form lease obligations, so they're not ideal LBO candidates. And the United States has more retail space per person than nearly every other country in the world. Some of that is justified by our higher average income and lower population density versus other countries, but I don't think that's the entire explanation. The U.S. simply has more retail space than it needs, which has pressured retailers' profitability. And that isn't necessarily a good thing for Amazon: the glut of retail space may lower rent costs for the surviving physical retailers. In 2003, Fast Company published an article called The Wal-Mart You Don't Know (hat tip to Petrichor Capital). It portrayed Wal-Mart as an unstoppable predator that used its market power to squeeze its suppliers and competitors. Today Wal-Mart is seen as a has-been, while Amazon is cast as the unstoppable predator. Wal-Mart's stock was flat for many years after the article. I expect Amazon's stock to be a similar or worse disappointment going forward. Last year, Credit Suisse published research claiming that the tobacco industry was the best-performing sector of the American stock market from 1900 to 2010. Similarly, Jeremy Siegel wrote in his 2005 book The Future for Investors that Altria, formerly Philip Morris, had been America's best-performing stock during its existence as a public company. And Altria has continued its winning ways since 2005, beating the S&P 500 by a wide margin. Tobacco companies have achieved their strong performance despite facing many challenges: sales and excise taxes on cigarettes have steadily risen over time, the number of cigarettes consumed in the United States has fallen more than 50% over the past 35 years, and a wave of product-liability lawsuits threatened to bankrupt the tobacco industry during the 1990s. Its ability to withstand these challenges, combined with its strong historical profitability and the addictive nature of cigarettes, makes tobacco stocks look invincible. Despite that, I believe that the industry's strong performance is coming to an end and that tobacco stocks are secular shorts. This article will focus on Altria because it's the largest American cigarette manufacturer, but I expect the whole industry to suffer in the coming years. Price hikes. Although cigarette sales volumes have fallen steadily, manufacturers have more than offset this by increasing their profit per cigarette. According to Horseman Capital, cigarette prices have tripled since 1998 and "British American Tobacco has seen its net profit margin rise from 5% in 1998 to 25% [in 2013]." The 1998 Master Settlement Agreement between the US states and large tobacco companies enabled these price increases by turning the cigarette market into an unofficial cartel. Rising valuations. Altria traded below 6x earnings in 2000, and it trades at 22x earnings today. Initially, its valuation rose as the threat of ruinous personal-injury lawsuits receded. Later, falling interest rates increased the multiple investors applied to Altria's stable cash flows and made its dividend more attractive to yield-seekers. Rising leverage. In March 2008, after spinning off Philip Morris International, Altria's tangible book value was $1.6 billion. Today it's -$5.2 billion. The main reason why Altria's net worth declined is its cash acquisition of UST in early 2009, which it financed by issuing $9.7 billion of debt. Offsetting that is Anheuser Busch's cash-and-stock acquisition of SABMiller, in which Altria held a major investment, which resulted in billions of cash proceeds to Altria and an upward revaluation of its remaining brewery investment. Excluding acquisitions and sales, since 2011 Altria has paid out slightly more than 100% of its earnings in dividends and stock buybacks. The company's ability to operate with historically high leverage and a 100% payout ratio is, in my opinion, key to its popularity with investors. • Nicotine may be addictive, but contrary to popular belief, addicts are capable of making trade-offs and delaying gratification. In one experiment, crack addicts who were offered a choice between drugs and delayed cash payments often chose cash. • In the United States, cigarette smokers are disproportionately poor and uneducated. Their ability to pay more for cigarettes is limited, so further price hikes may prompt them to quit smoking or roll their own cigarettes. • The Centers for Disease Control conducts surveys to measure teenage smoking. Historically, the percent of high school students who had used tobacco in the previous 30 days exceeded the percent of adult who smoked. The teen smoking rate fell below the adult rate ten years ago, however, and it has remained lower since then. I believe this presages an accelerating decline in the adult smoking rate. Paradoxically, e-cigarettes' superiority gives public-health agencies a reason to demonize them. If public-health advocates and bureaucrats define themselves as crusaders against the evils of tobacco, then replacing cigarettes with e-cigarettes eliminates their reason for being. Accordingly, the Food and Drug Administration took steps last year to impose onerous new regulations on e-cigarette manufacturers. 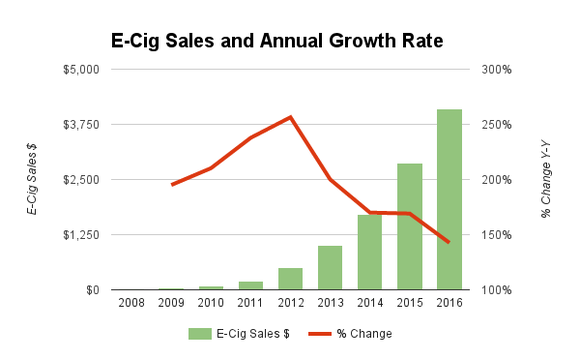 The Trump administration has dramatically reduced the growth of federal regulations, however, including delaying implementation of the FDA's rules for e-cigarettes. 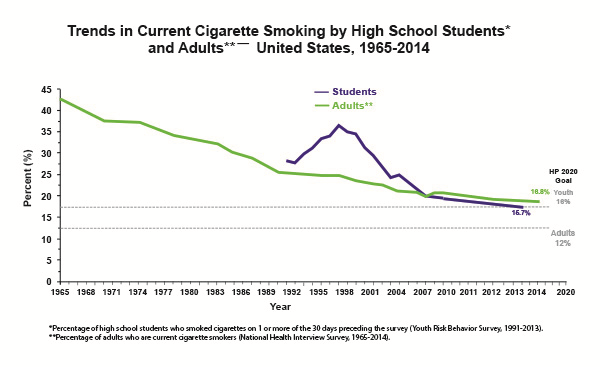 I believe the administration's hostility to regulation makes the continued growth of e-cigarette usage likely. Over the past couple decades, a virtuous cycle has lifted Altria's stock: swiftly rising cigarette prices have boosted its earnings, which has allowed it to operate with more debt and distribute more of its earnings to shareholders. Key to this dynamic is the cartelization of the tobacco industry, which e-cigarettes and falling youth smoking rates now threaten. If cigarette consumption continues to decline and tobacco companies are unable to effect offsetting price hikes, the virtuous cycle will go into reverse: Altria's earnings will fall, and then it will have to prioritize repaying liabilities over returning money to shareholders, and the stock will probably get a lower multiple on lower earnings. More generally, while cigarette manufacturers have enjoyed remarkable pricing power, no company, no matter how desirable its product, can increase real prices forever. Pricing power is better thought of as a reservoir--vulnerable to being drained through continual exploitation--than a perpetual motion machine. Harvest Investor writes about trends in agricultural productivity and their likely effect on the farm economy. George Dimitroff describes how the 1990 recession and September 11, 2001 attack affected aircraft prices. The Financial Post writes that Nortel Networks' multi-year bankruptcy has produced $2 billion of legal and professional fees compared to a remaining estate of $7.3 billion. The Private Investment Brief discusses why middlemen often thrive and resist dis-intermediation. Vienna Capitalist argues that, contrary to popular perception, quantitative easing and negative interest rates are deflationary. A guest commenter at Credit Bubble Stocks discusses the competing incentives that central banks have to pursue deflationary or hyperinflationary policies during economic crises. The Wall Street Journal claims that "[as with] steel and aluminum before, Chinese oil refining overcapacity is spilling into global markets and depressing profits." Wide Moat Investing writes that Joe Papa's compensation as CEO of Valeant is much lower than news reports have suggested. Vili Lehdonvirta argues that bitcoin is flawed and overhyped. Paul Kasriel argues that slowing credit growth, in conjunction with the Federal Reserve's tightening of monetary policy, is a risk to the American economy and stock market. See also Kasriel's follow-up post discussing the relative importance of commercial and industrial loan growth versus total growth of bank credit. Back of the Envelope describes the investment merits of Apetit, a Finnish food conglomerate and potential turnaround. Dividend Growth Investor enumerates the risks of international investing and provides an interesting overview of Russia's stock market in the decades before the Communist takeover. Fritz Capital writes about risks to the Chinese banking system in general and Bank of Jinzhou in particular. Investing Sidekick makes the case for Cambria Automobiles, a cheap car dealer in the United Kingdom. Variant Perception warns about China's declining credit growth. Paul Clikeman describes the careers of Ivar Kreuger and Philip Musica, two prominent Depression-era fraudsters. Flexport describes California's economic development during and after the 1848 gold rush. One of the biggest beneficiaries was actually outside California: A railroad built across the Isthmus of Panama to facilitate trade between California and the Eastern United States became profitable before construction was finished and was temporarily the highest-valued company on the New York Stock Exchange. h/t Danton Qu. Fortune provides a behind-the-scenes look at Microsoft's initial public offering. Quartz writes about Société des Moulins de Bazacle, the world's first joint-stock company. Jason Zweig reprints a speech that Ben Graham gave in 1963. Talking to Risk.net, John Arnold describes his trading strategy and explains why he doesn't use technical analysis. Jim Chanos discusses some of the political risks to capitalism, corporate profits, and the stock market. Graham & Doddsville interviews William von Mueffling and Sam Zell in its Winter 2012 edition. Jack Schwager summarizes the key ideas of his Market Wizards series of interview books. Texas Monthly exposes the judicial corruption that facilitated Pennzoil's successful lawsuit against Texaco in the 1980s. The Wall Street Journal describes Glencore's influence over zinc prices. Bloomberg describes how art lending can be used to launder money. Debtwire asserts that plugging and abandonment liabilities are an underappreciated risk for oil and gas companies operating in the Gulf of Mexico. Phil Flynn argues that the Energy Information Administration has overstated inventories of crude oil in the United States. KUT FM describes how the Texas Railroad Commission influenced OPEC. The Guardian exposes the scam known as scientific publishing. Institutional Investor profiles Jim Simons and Renaissance Technologies (from 2000). Bloomberg profiles the principals of TGS, a lesser-known quantitative fund that rivals Renaissance in profitability. The Wall Street Journal describes how the DiLorenzo family squandered one of New York City's largest real-estate fortunes in a generation. Fritz Capital describes the incentives that Wall Street analysts face and how they can influence securities prices. Morgan Housel discusses how personal experience can lead investors to overestimate or underestimate risks. Jan Woeltjen writes that, contrary to what one might expect, statistically cheap stocks that score poorly on measures of business quality have outperformed better-quality value stocks. Nicholas Vardy argues that investing will "never see another Warren Buffett or George Soros" because increasing competition among an increasing number of sophisticated professional investors limits the ability of any one investor to rise above the crowd. David Merkel pens a critical review of Thomas Phelps's 100 to 1 in the Stock Market. Skift chronicles Travelocity's decline from leading online travel agent to also-ran.